We humans are beings of habits. Regardless of whether a habit leaves a positive or negative impact on our body and psyche, we tend to get comfortable or even addicted to a particular habit. There are certain habits that might change our quality of life drastically and one of them is an addiction to smoking. Breaking these unhealthy habits can improve the quality of your life and help you in several ways. This article focuses on how to quit smoking or break any bad habit. Of course, habits are a fundamental part of our lives, but this does not change the fact that every habit we develop is geared towards improving our quality of life. Developing good habits are indeed essential to lead a regimented, efficient and healthy lifestyle. Moreover, many wise men would say that building healthy habits is difficult but breaking them is quite easy. Some habits are in fact unhealthy and it only takes a few minutes to build them and once formed, they demand a lifetime of effort to get rid of them. If you find this resonating with yourself, do not be surprised. Just like you and I, there are millions or even billions of people in this world trying to conquer their bad habits. However, without a proper approach, the task of breaking bad habits can feel impossible to accomplish or may even feel psychologically painful. Today, with the help of this article, I am going to try walking you through my journey of how I quit smoking and what I went through during that phase. Out of all the steps that you are going to take to quit smoking or break any bad habit is making a promise to yourself and sticking to it. Gentlemen, we have to understand that our mind is much more powerful than we can even imagine. When I talk about myself, making up my mindset to quit smoking took me a handful of weeks and a packet full of cigarettes. Therefore, it is paramount that you are concrete when you make up your mind to quit smoking or curb your bad habit as quickly as possible. One strategy that I can give to you is to visualize how you’re going to feel when the bad habit wouldn’t exist. Be very explicit about your visualizations. Once this part of the process is conquered, the rest is a piece of cake. Once you have conquered the first step, now is the time to stick to the promise that you have made. I recommend that you start journaling from hereon. Journal how each hour or segment of your day goes by as you restrict and save yourself from picking up on your bad habit you’re trying to conquer. Note down exactly how you feel. Just note it down. I promise you that within days, your journal is going to transform and with it, you are going to transform as well. As I said earlier that your mind is powerful than your body, but your body will yearn for another dose of addiction. This is when you need to be smart, strong and restrict yourself from engaging in the bad habit. You might find people suggesting you quit smoking or break your bad habit right away. What these people don’t understand is that there will be immense emotional pressure on you during the withdrawal process of breaking a habit or quitting smoking. 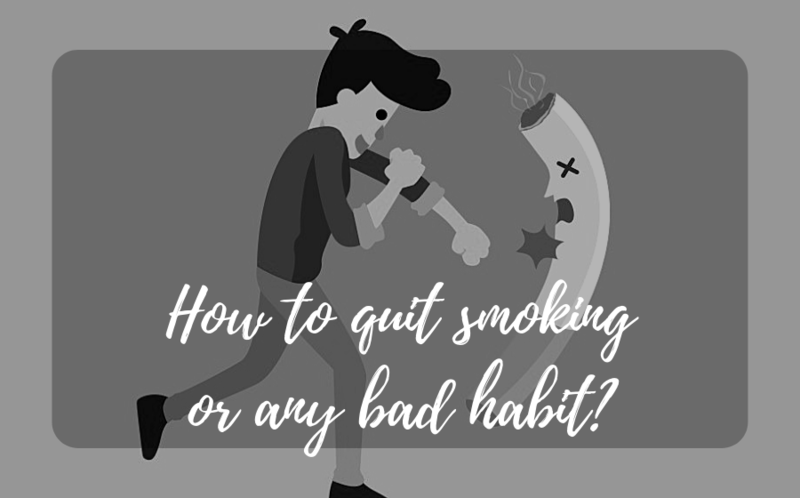 You might find it difficult to get over your bad habit and with all the robotic, systematic ideas and suggestions thrown at you, you are more than likely going to be overwhelmed and resume your bad habit. Understand, that people only want the best for you but what they don’t understand is how are you dealing with the situation, so don’t get mad neither at them nor at yourself. We humans are emotional beings and it is quite easy for us to get triggered with a momentary feeling, and therefore you have to hold your ground and stay strong while things might seem shaky on this journey. Replace you bad habit with a good one. When I started my journey to quit smoking, I also made a decision to replace this bad habit with a good habit. Whenever I felt the need to smoke, I resorted myself to eating fruits. I mostly smoked during office hours and fortunately, I discovered that there was a fruit vendor selling fresh fruits at a cheap price. That’s what I needed, a healthy replacement for my bad habit. Moreover, I continued journaling. All of this and you might already see where my journal is headed to. You know, I don’t believe in writing articles with 10 steps to quit smoking. I like keeping things precise and to the point and this is the final step to get over any bad habit that you might have. So, the final step is that you begin sharing your story with friends and family and even social media. Science says that once you quit a bad habit for 21 days, you no longer would find that habit interesting. What I have come to believe is that men learn as they teach. When you begin sharing your story with others and inspire them, you are going to reinforce the idea that breaking the bad habit was indeed good for you. You are going to feel good about yourself and you are going to admire yourself for the task you have accomplished. When this time is passed, you will clearly see the difference that you would have created in your life and as well as in the lives of other people that you love and care about. Moreover, when you help people to get over their bad habits, you will not sound robotic or systematic, but you are going to speak from a place of empathy and from experience. You will be sharing the stories of fighting your demons. You will turn into a man of inspiration that people will look up to and admire. There is one last thing that I want to add to this article, and it is that the journey of self-improvement never ends. It is quite easy for us to get drawn back to our old, bad habits even after we have presumably broken them. This happens because our body has already experienced it and it knows the feeling of getting high off of your habit and it will occasionally trick you to practice the habit again. This is why you need to be consciously aware of the actions that might lead you to pick up your bad habit(s) again. You will have to consciously take the right and necessary actions required to better yourself on a daily basis, which might also include leaving your friends or friend circle that practices bad habits. Furthermore, I do not impose that you never drink or smoke but keep these things under moderation, so that you get to enjoy them and not become a slave of them. I hope you liked what you read and I hope this article encourages you to curb your bad habit to dust.